Howdy, folks! Sorry about the delay with the strip today! A quick update on this year's week-long vacation: PIRATE COVE will be taking off from September 3rd through September 7th. There will be sketch filler updates that week, but ONLY over at the WEBCOMICS NATION site. Regular updates will resume on September 10th. In other news, there's a new movie coming out from Hyde Park Entertainment, which is the production company I work for when I'm not slaving away on PIRATE COVE. 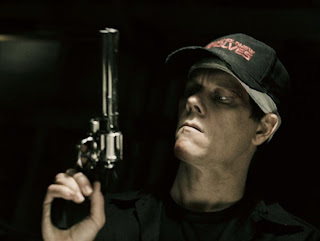 It's called DEATH SENTENCE, it stars Kevin Bacon (you know - that guy from the first Friday the 13th movie,) and was directed by Mr. James "the direct of SAW" Wan. The film opens on August 31st and is surprisingly effective. It's a story we've all heard before: man's loved one is killed, the bad guy is let go, man kills bad guy, all hell breaks loose... but this is the first time I've watched a movie like this where I found myself thinking "wow. What would I have done in a situation like that? Probably the same exact thing!" At least, that's what I was thinking when there weren't cars flying off parking garage roofs, people weren't launching themselves down flights of stairs, and body parts weren't being blown off with shotguns. This is a very violent movie, make no mistake! 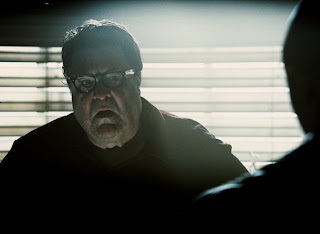 The best part of the movie, in my opinion, has got to be John Goodman. He has a very small role, but he steals every scene he's in. 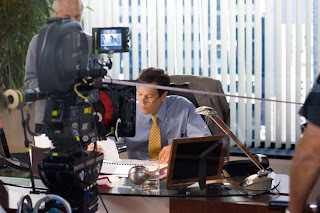 Heck, he steals the scenes surrounding the scenes he's in by osmosis. Anyway... that's all I've got for now. I'll try to post one more update before I head out for my week-long exile. Stay safe and watch out for revenge served with a side of Bacon! I was organizing some files yesterday when I came across a folder labeled "JOE IS DEAD." Inside, I found some artwork featuring the PIRATE COVE character of Joe, explaining to readers that Joe D'Angelo, the writer / artist of PIRATE COVE, had died and, rather than leave the audience with a cliffhanger, we had one last strip for them. Obviously, this was meant to appear in the event of just such a situation... and I'd totally forgotten about it! Well, calm yourself - I'm not dead. Not yet, anyway. Considering all the seismic activity that's been occuring lately, threatening to dump much of Southern California into the Pacific Ocean, I felt it was high time I revealed this ticking timebomb of a comic strip to the readers of PIRATE COVE. Regarding the quality and content of the comic itself, well, I was still working with a really crappy color palette so the skin tones look a bit garish. And as for the characters, well, you've got Joe, Safiya, Boris, Randy, Crow, Louis, Pete Sellers, and the floating eye belongs to Bruce the Wereshark. Give the image a click for a larger view. Enjoy! And let's be careful out there! August 15th, 2007: The San Diego Comic Con Report 2007! When this photo was taken, we'd already been at the 2007 San Diego Comic Con for over 48 hours. We'd given away nearly 200 PIRATE COVE sampler books, sold around 65 books, and were getting worried we would sell out of books before Saturday's end! We needn't have worried. Saturday turned out to be the slowest day of the convention! But I'm getting ahead of myself. On the morning of Thursday, July 26th, around 5:30 AM, Joe stumbled towards his Jeep, which he'd loaded with PIRATE COVE product the night before. Joe finds his friend Randy asleep in the Jeep's passenger seat. Randy is nearly 20 miles outside of Los Angeles before he wakes up to find the sun rising in his eyes. 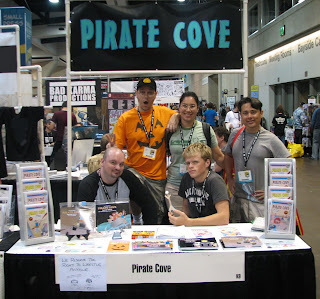 Just over 2 hours later, PIRATE COVE had set up camp in the Small Press Area of the San Diego Convention Center. Table K-9: featuring the all-new COMIC CONJOB 3 Comic Con exclusive, and the convention debut of professionally printed & bound editions of EPISODES 24 & 25, EPISODE 26, EPISODE 27, and EPISODE 28 in both full color and economical black & white. Once again, we plyed the public with with sample books and free magnets... all the better to get them hooked on the strip! As stated to one such visitor, "It's like dealing cocaine. You give 'em a taste for free, then once they're addicted, they'll come back to buy!" "Sinister," the visitor smiled. "With a sense of humor like that, I think I'm ALREADY addicted!" Sure enough, he returned on Friday and proceeded to buy a copy of COMIC CONJOB 3 as well as copies of EPISODES 24 & 25, and 26. By Saturday afternoon, we'd given away all of the free sampler books and were running low on the books we'd brought to sell. As mentioned above, Saturday turned out to be the lightest when it came to foot traffic in Small Press, despite the fact Saturday had been sold out for several weeks! 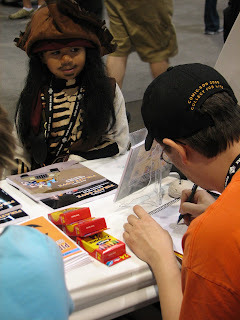 Despite the reduced crowd, there was still a lot to do on Saturday as PIRATE COVE fans young and old, new and longtime, came by to say hello, get a sketch, and talk about the future of the series. This year, Brian was the most requested character in sketches, although there were a few requests for Edre, Joe, and even a Chevre! Also of note, Robert "Chachi" Gomez stopped by the table and announced that MIRRORVERSE, the PIRATE COVE spinoff, WOULD continue at some point in the future. So keep checking back for more news on that front! Everything picked up again on Sunday, tho, and we proceeded to sell out of COMIC CONJOB 3! By the end of Sunday, it was a sellout! Every Lulu-printed book we brought had been purchased by the eager crowd and around 5PM, three-quarters of San Diego's temporary population began their mass exodus back to all corners of the globe. As always, I greeted the end of Comic Con with a mixture of relief, exhaustion, and great sadness. There never seems to be enough time to do everything I'd like to do at the show, yet I'm always ready for a week-long nap afterwards! Many thinks to everyone who stopped by to chat and I look forward to seeing you all again next year! I'm not sure which convention PIRATE COVE will pop up at next, but we're looking into WONDER CON in San Francisco as well as the New York Comic Con in Manhattan! Thanks for reading and, as promised, COMIC CONJOB 3 is now available to purchase through Lulu! Keep scrolling down for some more photos from the show! Woke up last night around 1 AM to the gentle feeling of being shaken like a dry martini. If you've never experienced an earthquake before, then I really can't describe it to you. I could try... but until you've experienced firsthand the sensation of the ground trying to buck you off the planet, you'll never really get it. I wouldn't go so far as to say it's FUN... but so long as the worst that happens is a few action figures jumping off the shelves, I don't mind the occasional tremor. What I really don't like about earthquakes in Los Angeles is that they are generally sneaky beasts. They like to strike at night. Or worse, when you're on the toilet. I'm not kidding, either - at least half of the quakes I've experienced since moving out here have happened while I was sitting on the toilet. There I was, doing my duty, when the shower doors began to rattle. Louis Grant was my roommate at the time and I remember saying out loud "very funny, Louis, cut it out" before realizing that A) Louis wasn't home and B) it wasn't very likely he'd have the strength to shake the entire San Fernando Valley. They also like to hit when I have guests visiting from out of town. And guests always react the same way: they run to the middle of the living room, legs spread wide, arms out at their sides as if they're about to be attacked by Gremlins. I was lucky enough to have avoided the most recent BIG earthquake that took place back in 1994, but have friends who were not so lucky. "This was barely an earthquake," one such friend remarked after last night's rumble. "It's comparable to a heavy truck rolling by. Wait until the house is dancing back and forth and your refrigerator has slid into the bed with you." Hmmm. North Dakota is looking pretty inviting these days.